On the third Saturday of each month, dozens of members of Our Savior Lutheran Church meet to help members of the community. They call this day Faith in Action, and it includes working on the Abundance Garden (which provided almost 1500 pounds of fresh food to local food banks), The Car Shop (with a hydraulic lift, on-site), as well as small painting, roofing and ground-beautification for seniors and others who aren’t able to manage household projects on their own. But the third Saturday in April is National Volunteer Day, and it’s the biggest day of the year for Faith in Action, and 2015 is no different. 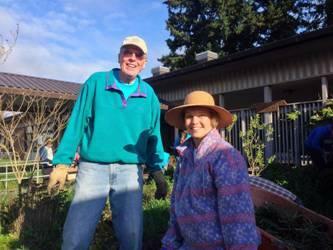 For the past two Aprils, OSLC has adopted Collins Elementary and Central Ave. Elementary schools. This year, the church is ready to go to high school! 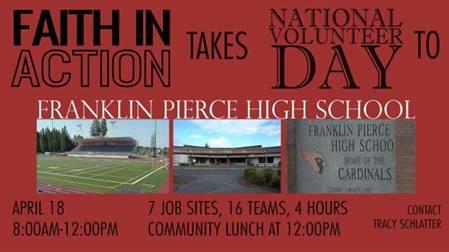 Since January, OSLC has been working with a community team of 16 recognized leaders at Franklin Pierce HS to organize what will be our largest outreach to date. With input from the administration, counselors, faculty, staff, and student body, this community-based team has identified seven work sites on campus and enlisted the support of 16 project leaders from the church and the school. The plan is to accomplish all this in a four hour day of service.Projects include parking lot beautification, installation of spirit banners along 112th Street, painting, installing decorative garden boxes, adding better signage to gymnasiums, installing bulletin boards strips in the cafeteria, and landscaping all five of the massive courtyards that span the campus. The students and teachers have rallied – literally. At a pep rally last month, the student body selected the spirit banners and parking lot as the most important goal for the day. When issued a challenge to show up and participate, ten teams and clubs responded by adopting the five courtyards as their areas to serve. OSLC is thrilled to partner with students representing the Football Team, Volleyball Team, National Honor Society, Link Crew, JAG, Key Club, Freshman Academy, Sophomore Action Team, League of Legends, and Leadership.